Watching ViARE's production of May Day Eve gave me the nostalgia and a quick trip down the memory lane when I was doing theater back in my alma matter here in Rizal. I'm so pleased to see traditional theater once again. Short, simple and intimate. To top it all, a great material is used from a well respected writer like Nick Joaquin. 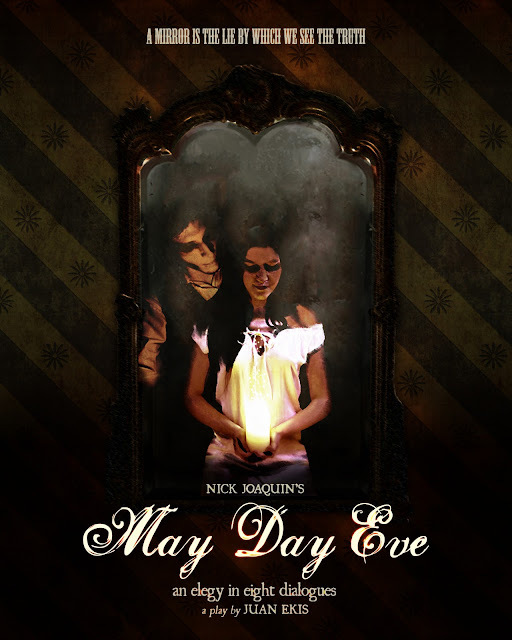 May Day Eve tells a story of a man and a woman who once falls in and out of Love. Everything starts with a ritual that should have created romance but instead a curse is brought upon all the people close to them and transcends through generations. The people who starts the curse tries to mend everything but until the end they failed leaving everybody victims of raging passion. No doubt the material is good. But my only concern is I fail to enjoy the show itself. Why? Because the actors have problems on voice projection. I know emotional intensity is also important to convey the heart of the show. From calm and quiet emotions to blazing rage, characters should show the shift of intensity levels so that we can distinguish the feelings among them. But Voice Intensity and Projection are two different aspects of theater. The two should not be directly proportional to each other. As the intensity rise or drop, the voice projection should stay on one level where audience can hear every word of the script. This is why I can't appreciate Mr. Juan Ekis' work, because I can't hear it. The only character I think who has a good voice projection is Ms. Sarah Badr who plays Anastasia (the gypsy woman) and Ms. Frankie Pascua who plays the Old Agueda. And the rest are all whispering in the air. You don't need microphones like what some of my friends say. The auditorium is small. Just a little adjustment on voice projection is enough to make the whole experience enjoyable. Then add to the poor voice volume the unconventional stage blockings. The blocking could have worked perfect... if we can hear the actors. Imagine, the actors are facing on the other side of the stage and we can't hear anything from them. I hate to admit it but it is quite irritating. And lastly during in between scenes, I'm not sure if it is intentional to put dim lights for props men. I just feel it is very distracting to see them moving props on the stage. I believe its a basic training on theater that props men don't need direct light during this intermissions. That's why it is called "lights out". Other than that, everything works fine. The simplicity of production design and costume, and the music are all perfect. Despite my concerns above, I'm glad to see another traditional play after a very long time and I would be happy to watch it again and hope to see improvements which I think will not be a big problem to the director. Directed by Christian Vallez aka Juan Ekis, May Day Eve Premieres today September 27, 7PM in Telengtan Hall, 5th floor Apec Communication Building, University of Asia and the Pacific, Pearl Drive Ortigas Center, Pasig City.